In 2011, I began Sleet City Signwriting with a passion to revive traditional sign-painting in Northwest Arkansas. I’ve had the privilege of working with some incredible clients over the past 5 years, such as Onyx Coffee Labs, Thrive, and Shindig Paperie. Additionally, I am the Community Development Coordinator for The Little Craft Show, a juried, indie craft show attracting over 15,000 attendees a year. When I’m not painting signs or working on The Little Craft Show, I have a few exciting side projects that I’ve been working on. 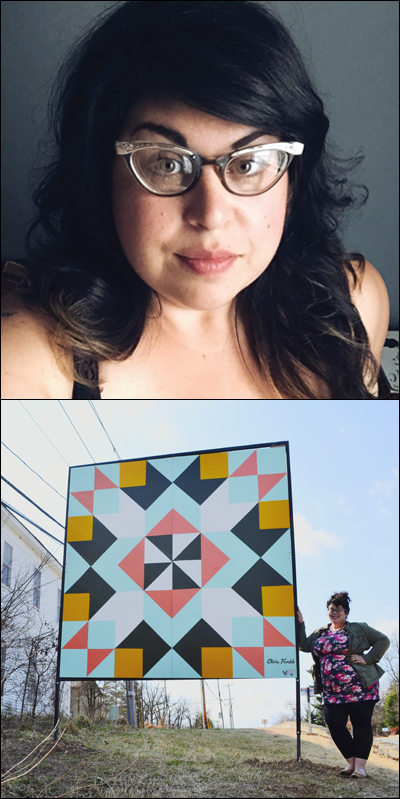 Most recently, I just installed my second public art piece in a series I’m calling The Quilt Square Project. This is a project in partnership with The Springdale Art Initiative and the Shiloh Museum of Ozark History. What began as small quilt paintings for my friends and family has turned into a large-scale side project. 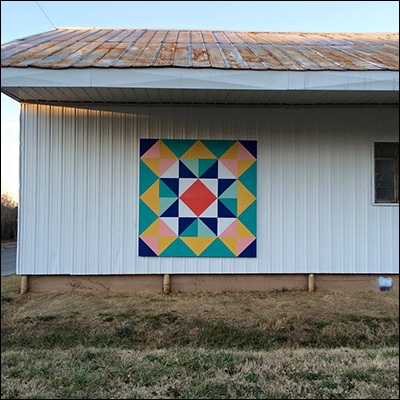 The concept is simple, I research and find traditional, Ozark quilt patterns, add a contemporary color palette, make it an extra large 8-foot by 8-foot square, and then install it in a public space. I love this project for so many reasons: A quilt for me symbolizes hard work and comfort; Quilts are easy to recognize and most people can connect with them no matter what their background might be; A quilt takes time—it’s a labor of love and that’s precisely what this side project is for me. I enjoy staying busy. I enjoy painting signs for my clients, but, more than that, I enjoy getting involved in community projects. I love the satisfaction of starting a project and seeing it through. At the end of the day, I’m only able to have these side projects, because I have an incredibly supportive family and group of friends who consistently help me bring my crazy ideas to life. Managing these projects is a true labor of love and a constant balance of time and energy. Side projects are an incredible way to stay inspired and involved in your community. While it’s important for me to build my business, it’s equally important for me to dream a little bit outside of the box and challenge myself creatively. Side projects are often the root of something much greater and lead to bigger projects or passions that continue to evolve and keep me going. Diptych courtesy of Olivia Trimble.